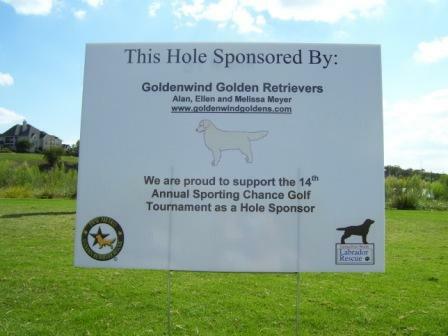 Goldenwind Golden Retrievers are avid supporters of Golden Retriever Rescue. We are members and volunteers of Dallas/Fort Worth Metro Golden Retriever Rescue (DFWMGRR) and support North Texas Golden Retriever Rescue of North Texas. Ellen was DFWMGRR’s Medical Coordinator 2009-2011. It is the responsibility of reputable Golden Retriever Breeders to give back to the breed by helping to support Golden Retriever Rescue. Reputable Golden Retriever Breeders must include in their sales contract that they will take back a dog of their breeding at any time during that Golden Retriever’s life. Unfortunately there are many so-called ‘breeders’ who do not care about their puppies past the moment money exchanges hands and many of those Golden Retrievers end up homeless. Without Rescues such as Golden Retriever Rescue of North Texas and Dallas/Fort Worth Metro Golden Retriever Rescue, those dogs would have no place to go or would not have the opportunity to be pulled from a shelter before losing their lives needlessly. Are you waiting on a puppy and lonely without your companion? Why not consider fostering a dog in need. Golden Retriever Rescue of North Texas and Dallas Ft. Worth Metro Golden Retriever Rescue can always use help caring for Goldens that are in medical care waiting to be released for adoptions. Many of the dogs come in heartworm positive. After a short stay in Rescue’s care, they would start the heartworm treatment. Then they would sit in a crate for 4 weeks waiting for the treatment to do it’s job. They have to be hand walked out to potty, but no real exercise. They can snuggle with you on the couch while you watch TV or sit at your feet while you work on the computer, but they cannot run around and play. These are easy care dogs that have already passed the incubation period for having picked up something from the shelter. They also have the golden oldies that take some time to find a golden heart willing to adopt a senior. Foster homes are the “nursemaid” getting the dog ready for their “happily ever after” in their new “Forever home”. Why not enjoy the company of a golden while waiting for your puppy and help that dog by giving him a temporary place to stay while he waits for his forever home? You can foster any length of time you wish from a weekend while a regular foster is out of town to a few weeks, to the duration of a dog’s care – it’s up to you. Rescue pays for all the dogs’ medical needs and finds their adoptive family, you just supply his or her daily care. RECYCLE Love T-Shirts are back in stock. goldenwindgoldens@gmail.com 972-442-9723Copyright © 2005 Goldenwind Golden Retrievers. Reproduction in whole or part in any form or medium without express written permission of Goldenwind Golden Retrievers is strictly prohibited.